I really want to tell you about this Chocolate Cherry Crisp that I made from White on Rice Couple’s cookbook, Bountiful. I want to tell you about these gorgeous cherries and about how excited I am that cherries are back in season and are inexpensive enough that you won’t have to take out a home equity line of credit just to buy a bag! 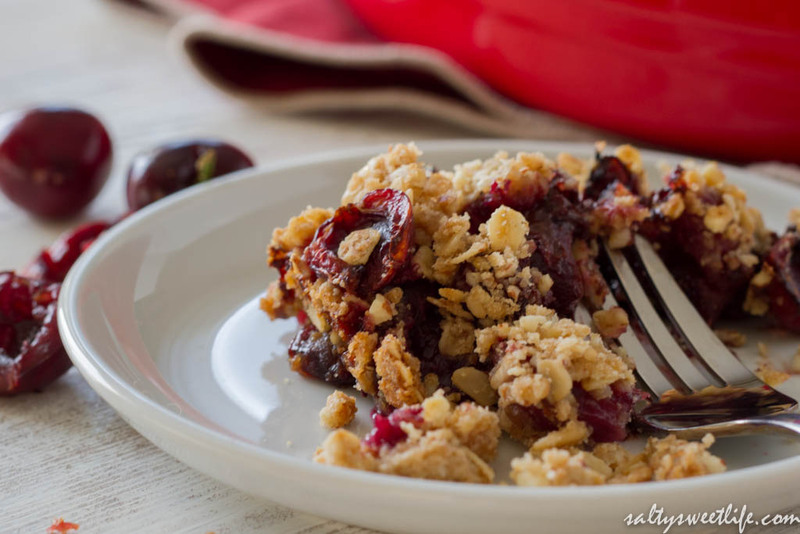 I want to tell you how absolutely luscious this crumble is–how the sweet, tender cherries and rich dark chocolate smoosh together perfectly under that crumbly topping. But before I do any of that, I want to tell you that I am having the hardest time writing these days. I’m not sure what’s causing my words to jam up inside of me like a spoonful of cold peanut butter, but they are. I mean, I just used the word “smoosh” in a sentence and I’m 100% sure that’s not a real word, but it’s going to have to stay that way, because the other word I’m thinking of just vanished into thin air. Have you ever experienced this? So with that, I’ll have to ask you for a pass on trying to describe this dish in a perfectly descriptive and fooderly manner, because it’s Just Not Going To Happen. Not today at least. 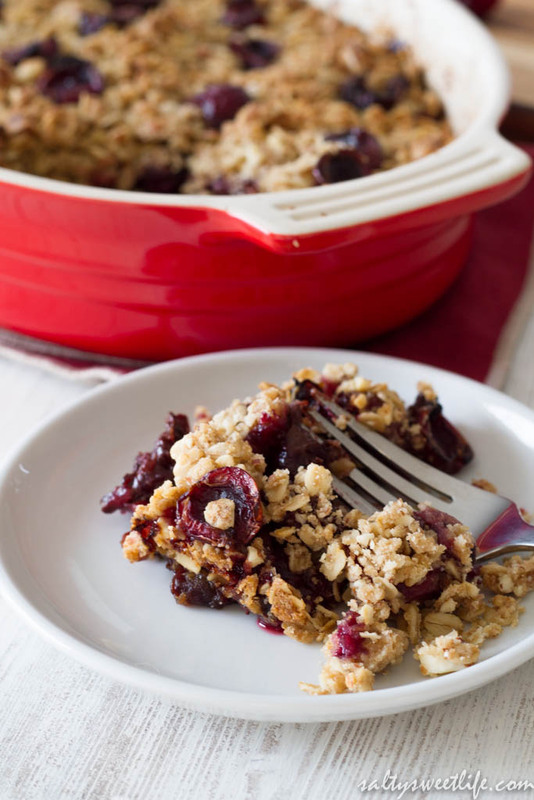 So, without further ado: You should make this crumble because cherries. And chocolate. It is yum. 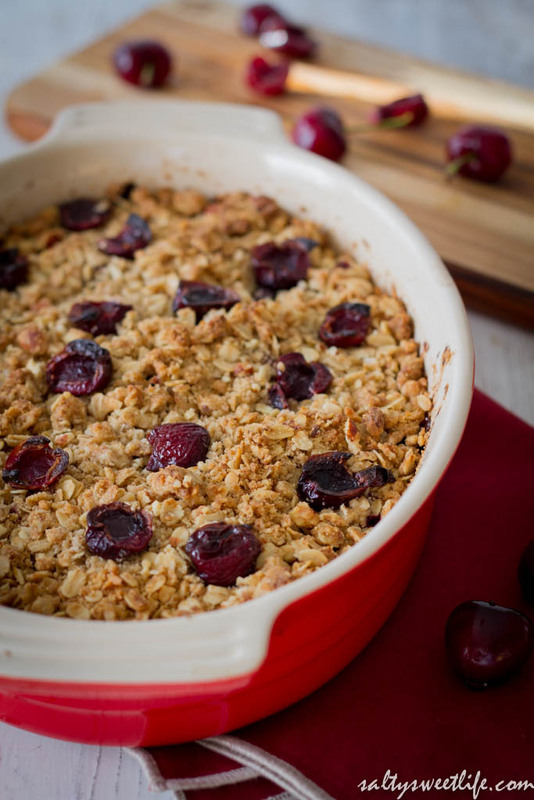 The most difficult part about this dessert is pitting the cherries. I don’t own a cherry-pitter and I don’t plan on owning one because it violates my rule of not buying kitchen tools that only serve a single-purpose. But I did learn a fun little trick from Food & Wine’s Mad Genius Tips on how to pit cherries using chopsticks and a wine bottle! It worked! In fact, it worked really well, but it still takes a bit of time and patience and I admit, I was pretty slow at first. I made very few changes to the original recipe. I used a touch less chocolate than what was called for and I added almonds to the topping because I just love almonds and cherries together. I also used my food processor to make the topping, but it can easily be done by hand as well. The food processor simply shaves off a bit of time. Preheat the oven to 375 degrees. Butter a medium sized baking dish (about 2 quart size) and set aside. First make the topping. In the base of a food processor fitted with the chopping blade, add the almonds and pulse until chopped. Add the flour and the cubed butter and the sugar and pulse just a few times until the butter is cut into the flour in pieces the size of peas. Add the oats and pulse twice to combine. Remove the mixture from the food processor and place it into a medium sized bowl. With your fingers, press the mixture together until clumps form. Place the topping in the refrigerator while you prepare the filling. If you are not using a food processor, simply chop the almonds by hand (if using). In a medium sized bowl, mix the flour with the butter and the sugar and with your fingertips, cut the butter into the flour until you get pea-sized crumbs. Add the oats and almonds and squeeze the mixture together until soft clumps form. Reserve a few cherries to use as a garnish, then in a mixing bowl, place the pitted cherries, sugar, chocolate chips and flour and gently toss to combine. Pour the cherry filling into the buttered baking dish and sprinkle with the topping and the reserved cherries. There was enough topping that I had some left over to use for future berry crumbles. These kinds of toppings freeze very well. Bake for 45-55 minutes or until the filling is bubbly and the topping is golden brown. I had the amazing opportunity to attend a food photography and food styling workshop with Diane Cu and Todd Porter last month and I cannot say enough great things about them. They are so full of knowledge and they are so generous with that knowledge! Last weekend, they taught a 3 day online workshop through Creative Live that was just spectacular. If you are interested in learning more about food styling and food photography, the class is available for purchase and download. I’m not being paid by the company to tell you about it, but I just want to pass along the information because it was an incredible class and Diane and Todd are amazing instructors! Tracey this is beautiful! And thank you for sharing so many wonderful tips. I am about to start watching the free, 30-minute video on cherries. I am sure I will buy the whole class by the end. This crumble looks scrumptious! Hi Ali! It is really wonderful to “see” you! I attended their workshop in person last month and I watched as much of the online class as I could. I ended up buying it as well so that I can watch the parts that I missed! 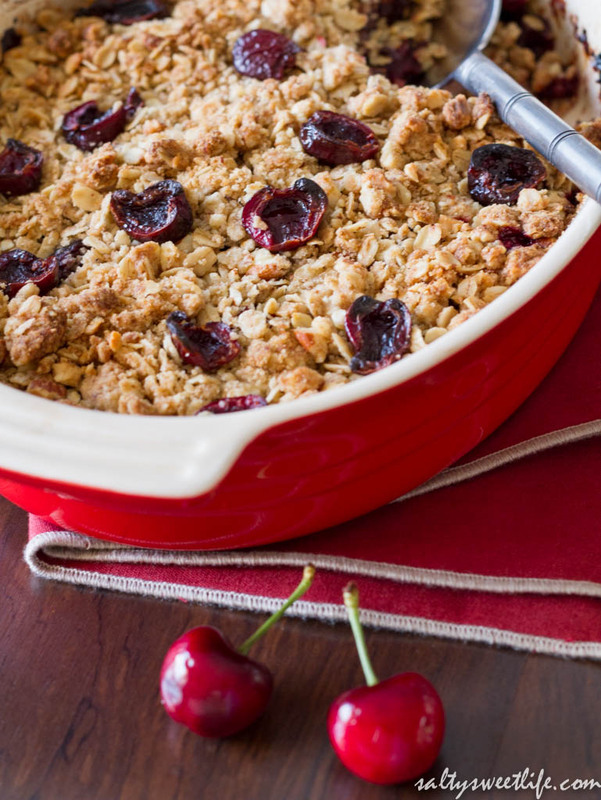 The crumble really is delicious–definitely the kind of dessert that I enjoy most during the summer! I hope you are enjoying your summer so far! Next PostMy First Ever Blog Award: The Liebster Award!